Kemal Ruzgar came off the bench to score a double for Leverkusen. 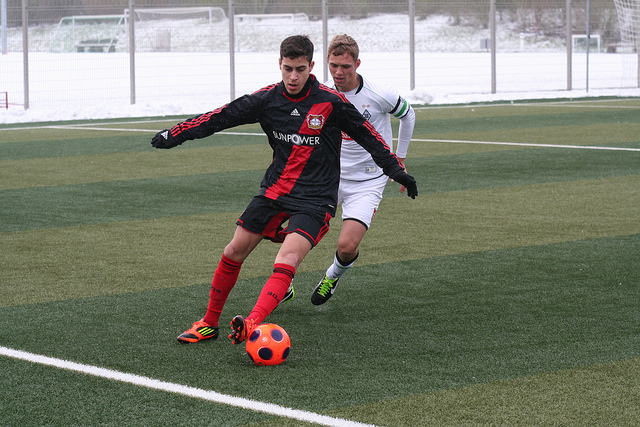 This weekend’s crunch game was Bayer Leverkusen against Borussia Dortmund in the Junioren Bundesliga’s western division. Dortmund have struggled to make too much of an impact on the league this season but Bayer Leverkusen are flying high at the top of the league and were unbeaten previous to this fixture. Thankfully for them they remain unbeaten and sailed to victory on Sunday afternoon with two goals from substitute Kemal Ruzgar in the 77th and 85th minute. In fairness, Leverkusen left it late and the win was thoroughly deserved after they dominated large periods of the match with Marc Brasnic and Maximillian Wagener coming close early on. Borussia Moenchengladbach 0-0 Schalke, Leverkusen 2-0 Dortmund, Duisburg 2-2 Wuppertaler, Oberhausen 0-2 Rot Weiss Essen, Bochum 2-2 Koln, Fortuna Dusseldorf 6-2 Arminia Bielefeld, Bonner SC 4-1 Theesen. VFL Wolfsburg made it a perfect ten wins out of ten with their win against Hansa Rostock this weekend. They have now scored 44 goals in those ten games and conceded just nine as they maintain the best record in the whole of the German youth system. The scorers are now becoming household names as Federico Palacios Martinez, Phillip Muller, Tolcay Cigerci and Oskar Zawada all scored on Sunday afternoon. Wolfsburg did have to recover from one behind though as Bjorn Schlottke put the visitors ahead on the 12th minute. Wolfsburg coach Dirk Kunert said: “It was a difficult external conditions for both teams with a lot of wind and a deep soil. “At 0-1 we have coped well and completed our game. It was important that we scored before the break and refilled after the change. Osnabruck 2-2 Dynamo Dresden, St Pauli 3-1 Lubeck, Carl Zeiss Jena 1-4 Holstein Kiel, Rot Weib Erfurt 2-0 Hamburger, Werder Bremen 2-1 Union Berlin, Wolfsburg 4-1 Hansa Rostock, Hertha BSC 0-0 Hannover. Freiburg and Eintracht Frankfurt have two of the most flourishing academies in Germany at the moment and they came head to head on Sunday with just a single goal separating the two sides. It was an effort by Noah Michel from the penalty spot that proved the difference to put Frankfurt just three points off group leaders Stuttgart, who beat Augsburg this weekend.